Sea fans are soft corals that look much like underwater plants. They are distinguished by the possession of spicules that are made of a horny substance called gorgonin from which they derive structural support. They are often called Gorgonians (from gorgonin) and some taxonomic systems place them in the Order Gorgonacea. Soft corals, such as sea fans, reproduce both sexually and asexually and have several methods of doing either. Sea fans have separate male and female organs, also known as hermaphroditic. Most sea fans reproduce by spewing massive quantities of gametes (eggs and sperm) into the open ocean water. Larvae that are not consumed by filter feeders plant themselves in the mud or sand and form a new colony of sea fans. The female sea fan produces so many eggs that it doesn't matter if one is eaten because most will form new colonies. Because the offspring are in the water from the time they are fertilized, there is a good chance that the new sea fans will be carried far from their parent colonies by ocean currents. 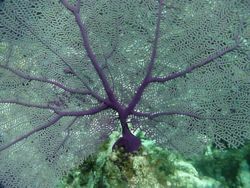 As a result, when they broadcast all their eggs and sperm making new polyps, Sea fans and many other soft corals species are often found in oceans all over the world. Some colonies settle very close to their mother colonies or where they were released, this enables a fast colonial growth. This page was last modified on 23 April 2015, at 16:18.